Amazon.com Price: $576.00 (as of 2019-04-25 20:12:11 GMT) Product prices and availability are accurate as of the date/time indicated and are subject to change. Any price and availability information displayed on Amazon.com at the time of purchase will apply to the purchase of this product. 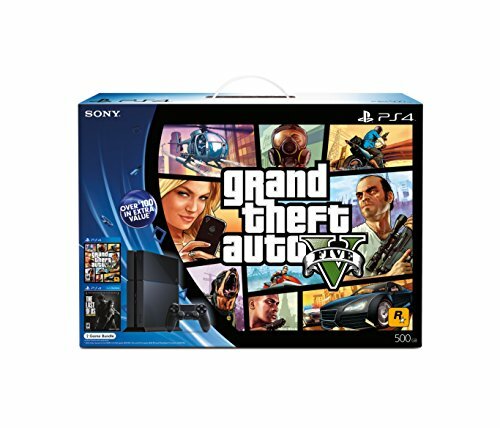 Bundle Includes: black PlayStation4 System 500 GB, black DUALSHOCK4 Wireless Controller, AC Power Cord, HDMI Cable, Mono Headset, USB 2.0 Cable, Grand Theft Auto V, The Last of Us Remastered download voucher. A young street hustler, a retired bank robber and a terrifying psychopath must pull off a series of dangerous heists to survive in a ruthless city in which they can trust nobody, least of all each other. Experience Grand Theft Auto V like never before with across-the-board graphical and technical enhancements for a deeper, more vibrant world on the PS4 system. Explore a hostile post-pandemic world in The Last of Us Remastered for the PS4 system as you experience the award winning story of Joel and Ellie, two survivors who must rely on each other through a brutal journey across what remains of the USA. Grand Theft Auto V for the PlayStation 4 system features across-the-board graphical and technical enhancements for a deeper, more vibrant world. Transfer your existing Grand Theft Auto Online characters and progress, from PS3 or Xbox 360 to the PlayStation 4 version. Returning players to Grand Theft Auto V get exclusive vehicles, weapons, collectibles and more. Explore the beautiful, decimated world of The Last of Us Remastered, fully realized with the power of the PlayStation 4 system. Assassin’s Creed III Liberation PlayStation Vita Wi-Fi Bundle $179.99 v $249.99 TODAY ONLY!